In June 2015, when the partially decomposed body of an unidentified little girl, known as Baby Doe, was found in a trash bag on a beach on Deer Island in Boston Harbour, the National Center for Missing & Exploited Children in the United States (US) contacted US Customs and Border Protection’s (CBP’s) forensic pollen expert, Andrew Laurence, for help. Laurence, one of the world’s foremost forensic palynologists and one of only two such experts in the US, has helped the Center identify the geographical origins of other children in the past. He found more than 30 different types of pollen grains on the Baby Doe evidence sent to him. Most were common to the Northeast. “There was a lot of pine, oak, birch, and a little bit of spruce,” he said. But then, there were the unexpected types of pollen that he found. Baby Doe’s clothing and blankets contained two types of Cedrus or cedar pollen grains. One of the species in the sample was cedar of Lebanon. “It didn’t grow in New England until the early 1900s, when the Arnold Arboretum of Harvard University in Boston imported a specific variety of the trees that now grow throughout the area,” said Laurence. But it was the second species of cedar that clinched it. “The only place I could find the second type of cedar was the Arnold Arboretum, so I knew that Baby Doe was from the Boston area,” he said. Although pollen analysis has been used for forensic purposes for several decades, it is a new technique for US law enforcement. As the only US federal agency with a forensic palynologist on staff, CBP is leading the US law enforcement community in using this new forensic tool for investigations and intelligence. Forensic palynology, not a widely known field, is defined as using pollen and spores to solve criminal or civil legal issues. Essentially, there are two types of forensic palynology. The first is when pollen is used to investigate crimes. The second is when pollen is used to determine the geographical location or ‘geolocation’ of items or people. 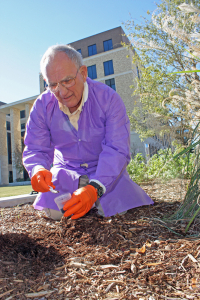 “Every location in the world has a unique pollen print – just like a fingerprint,” said Vaughn Bryant, a Professor of Anthropology and the Director of the Palynology Laboratory at Texas A&M University in College Station, Texas, who is regarded as ‘the father of forensic palynology’ in the US. Similarly, every plant has its own unique pollen grain. “There are about 300,000 species of plants in the world. Each one produces a unique type of pollen,” said Bryant. One of the reasons that pollen is so well-suited to forensic investigations is because pollen is everywhere. “Any object that is exposed to the environment is collecting pollen,” said Laurence, one of Bryant’s former students and his protégé. “We can analyse pollen to reconstruct the environment of where that object came from or the different places that it’s been. For example, we can trace the route of a truck as it travels through different ecological and vegetation zones, because as the truck travels, it’s collecting different types of pollen grains,” he said. Pollen is also indoors. “When people are going in and out of a building, they’re collecting pollen,” said Laurence. “They bring the pollen in on their clothes and it transfers into the air inside the building. There can be up to 10,000 pollen grains per cubic metre of air, roughly the space inside a home refrigerator,” said Laurence. However, forensic pollen analysis isn’t ideal for every type of situation. “If you have a sample that has been exposed to the local environment for a couple of days, chances are it’s so heavily contaminated with local pollen that it would be difficult to determine where it actually came from,” said Laurence. The earliest reported case of forensic pollen analysis successfully being used as criminal evidence occurred in Austria in 1959. Pollen found on the soles of a suspect’s muddy boots was linked to the site where a man had disappeared while vacationing along the Danube River near Vienna. During the 1960s and 1970s, there were other European criminal cases that used pollen as a forensic tool to link suspects to events or crime scenes. In America, forensic palynology took root in 1975, when Bryant, a botanist who had studied pollen at archaeological sites, started to analyse pollen for forensic purposes. The US Department of Agriculture (USDA) tapped his expertise for a loan subsidy programme to help US honey farmers. Bryant tested honey samples, identifying the pollen content, to determine if the honey was produced domestically – one of the requirements of participating in the programme. After five years of identifying pollen, Bryant became an expert. But then the price of honey on the world market soared and the USDA ended its honey subsidy programme. In 1980, Bryant was not able to find anyone in the US who wanted to hire him for his forensic palynology skill. “No one at that time was doing forensic palynology anywhere in the world except New Zealand,” said Bryant. In the 1990s, interest in using forensic palynology reemerged in countries such as the United Kingdom, but the US lagged behind. It was not until after the 11 September 2001 terrorist attacks that pollen was used as a forensic tool. 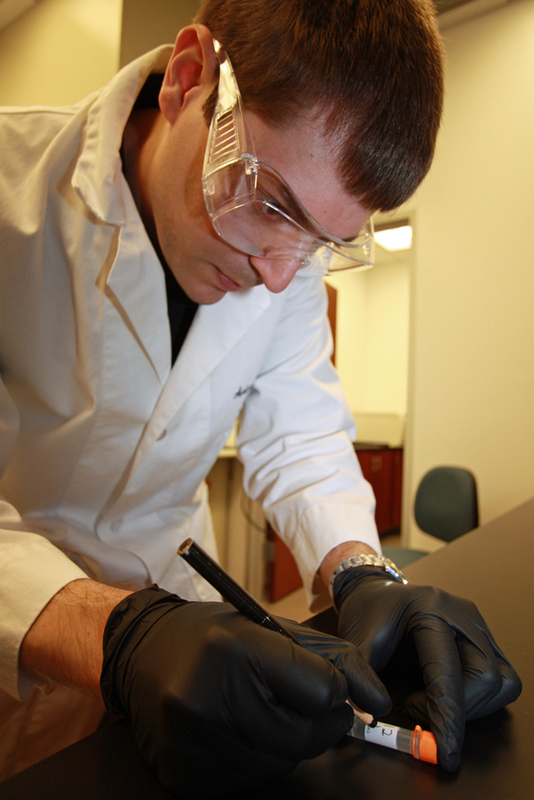 One of the US intelligence agencies contacted Bryant about using his forensic palynology skill for security purposes. “I was looking at samples that had been collected by the intelligence community from places where terrorists were active. There were samples of everything from rugs to cars to people to dwellings to weapons – even bombs,” said Bryant. Then, just as his work with the intelligence agency was winding down, CBP reached out to Bryant. “We had intelligence gaps related to the movement of narcotics. We wanted to know more specifically where the drugs were coming from, how they were grown, and how the cartels were operating so that we could strengthen our interdiction efforts,” said Patricia Coleman, Acting Director of CBP’s Office of Intelligence. One of the first samples that Bryant tested was from an 8,000-pound (3,629 kg) marijuana seizure taken from a warehouse in San Diego, California in November 2011.The warehouse was connected to a drug tunnel that ran beneath the US-Mexico border. Two weeks later an 8,646-pound (3,922 kg) marijuana seizure was made at a ranch in Starr County, Texas. A few months later, Bryant did pollen testing on another batch of shipments. This time with Laurence’s help. Between March and May of 2012, CBP officers and Border Patrol agents made numerous marijuana seizures on the southern border near El Paso, Texas. Further inland, state and local law enforcement agencies also made several marijuana seizures that involved heavy farm equipment used to smuggle the drugs. “We thought there was some connection among these shipments because the drug seizures were coming through the same channels,” said Goldfarb. “Through forensic pollen analysis, we discovered that all of the marijuana had a specific pollen type, a ‘key marker’ that stands out. It’s a pollen that generally points to a very precise location. In this case, the plant was sagebrush,” he said. Although there are more than a 100 species of sagebrush in the US, in Mexico, there is only one known species, which only grows in a few isolated locations. “We were able to narrow down very precisely a particular area of Mexico where the marijuana was cultivated,” said Goldfarb. “This tied into a bigger case involving a specific drug trafficking organization in Mexico that was under investigation. The pollen analysis linked this organization to the marijuana seizures in Texas,” he said. CBP shared information with the Mexican government, and in June 2012, Mexican authorities raided a farm outside of the city of Chihuahua, where they seized 400 kg of marijuana and 13 sacks of marijuana seed weighing almost 300 kg. By this point, it had also become apparent that CBP needed to hire a full-time forensic palynologist. “Once we started getting results, things took off,” said Coleman. “We couldn’t keep up with the demand. We literally had a backlog.” Bryant recommended Laurence who shared his passion for forensic palynology and had proven to be gifted in the field. Laurence now works full-time at CBP’s Houston laboratory. One of the cocaine cases that Laurence worked on was a drug bust in Detroit, Michigan in November 2013. The cocaine, which was not destined for the US market, was seized from a truck before it exited the country to Canada. The truck’s manifest indicated that the truck had travelled from Salinas, California. “We wanted to verify that,” said Laurence. The pollen revealed that the truck did originate in Salinas, drove up the coast to San Francisco, and then turned east, travelling through Nevada, Utah, Wyoming, Nebraska, Iowa, and Illinois until it eventually arrived in Detroit, where the cocaine was seized. 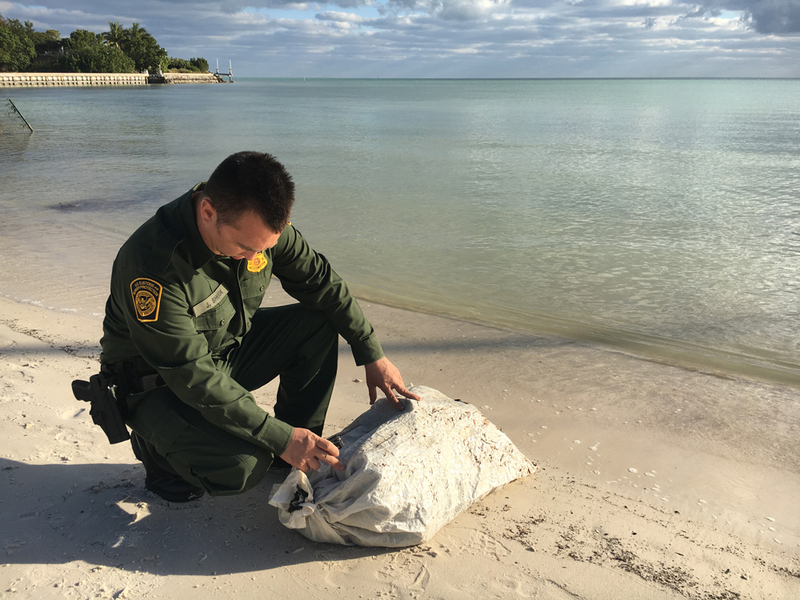 Pollen analysis also has helped CBP trace the routes of marijuana and cocaine bundles that wash up onshore along the coasts of Florida and Texas. 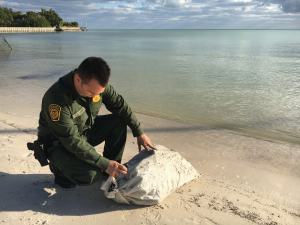 As early as 2011, the Border Patrol in the Miami Sector started to see a steady increase in drug bundles washing-up in the Florida Keys. “We had over 40 wash-ups in fiscal year 2015,” said J.R. Shook, a Border Patrol agent in the Miami Sector’s Intelligence Unit. “From the trends we’re seeing during the first quarter of 2016, we expect that number to rise.” Compared to the same period last year, Border Patrol statistics for the state of Florida show nine times the number of marijuana bundle wash-ups. When bundles are found, the Border Patrol sends samples to Laurence for testing. “The majority of the wash-ups are bundles of marijuana from the Caribbean, especially Jamaica,” said Coleman. “What clued us in was the samples we examined are loaded with fern spores, more than would be typical of an area where ferns grow. There are only a few areas that have that many ferns and one of them is Fern Gully, a winding, scenic stretch of road in Jamaica,” said Coleman. Before long, the pollen testing was expanded to gather intelligence on other aspects of CBP’s mission including seized weapons, currency, and even identifying travel routes and places of origin of criminals, potential terrorists, and other persons of interest. 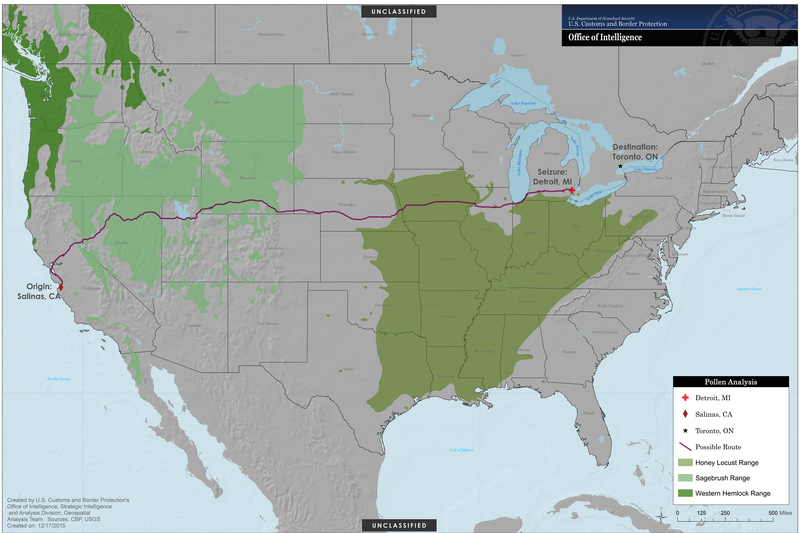 © CBP Office of Intelligence – Pollen analysis revealed that a truck carrying a cocaine shipment travelled across the US from California to Canada instead of taking the most direct route up the West Coast, giving CBP an investigative lead and filling an intelligence gap. But there are often complications. For example, if a cocaine sample is not completely pure, the impurities need to be dissolved. “It takes time to figure out what those impurities are and what can dissolve them,” said Laurence. Other times there could be a lot of sediment in the sample that traps the pollen. “This adds a lot of extra steps and a lot more time,” he said. One of Laurence’s biggest challenges is knowing what grows in various places around the world. In some countries, like the US, extensive pollen mapping studies have been done. In other places, such as the Middle East, South America, and Mexico, information is scant. “It’s either because of political reasons or some places are just very difficult to get to like the Amazon,” he said. Laurence and Bryant also rely on reference collections, databases, books, and other forensic palynologists, however, there are few.